Don’t get me wrong–I am all about collaboration. Interesting ideas, different perspectives—it’s all great. But sometimes in a working meeting, you have to take control of the whiteboard marker and not let anyone else touch it. It’s a bold move and should be used sparingly, but sometimes, taking over a meeting is the best option. 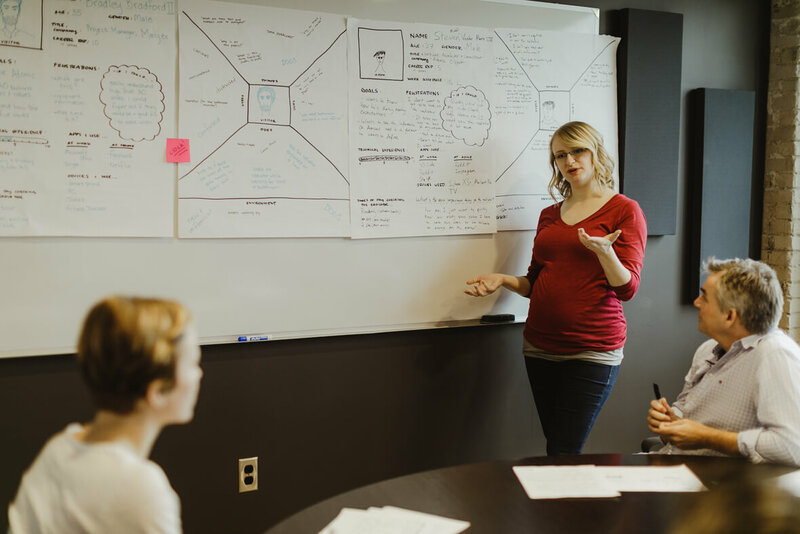 At Atomic, we are pretty good at facilitating meetings and workshops. We plan activities down to the quarter-hour with great care and purpose. But sometimes, there just isn’t the time to run through group activities like Design Sketching or making heavy use of sticky notes. When time is limited, it’s important to take control of the meeting from the beginning. This is not about leading the group to “your” ideal answer. This is just focusing the group within certain parameters of the discussion. Remember the old saying about “too many cooks”? When hosting a client meeting with people who have different skill sets or work in different parts of the organization, everyone will have a perspective that’s a little (or a lot) different on how things should work or look. While it seems like the group is coming up with a lot of ideas, individuals often stay within their own biases when contributing to the team. It’s hard to ideate, synthesize, and find consensus all within a single meeting or workshop. By controlling the marker, you can make sure that only ideas that have attained group consensus can make it to the whiteboard. First and foremost, you should be standing the entire time. Even if it’s a three-hour meeting, the minute you sit down, it opens the door for people to try to take over the meeting. If you’re not leading, someone else will want to take the role. Don’t allow sidebar conversations. You’re not leading when a couple of people are having their own discussion and making their own decisions about how something should work or look, without involving the rest of the group. Allow one-on-one discussions, but try to time-box them, find the consensus in their discussion, and add it to the whiteboard. When one-on-one conversations happen in a meeting, sidebar discussions may start to happen as well. Ask direct questions to specific individuals, and be an active listener. If it’s wrong, erase it. Sometimes you draw or write something too soon, or the requirements change after a later discussion. Make sure you erase ideas that won’t be moving forward. In certain cases, not sharing the marker is what it takes to lead a meeting in a structured way. It is still a highly-effective means for collaboration.